In summer 1856 Ferdinand Gregorovius spent three months in the small town of Genazzano; he described his stay there and in other nearby towns in Aus der Campagna von Rom (About the Roman Campagna) (you can read the English translation by Dorothea Roberts in Bill Thayer's Web Site); he started his account by describing the itinerary he followed to reach Genazzano; he left Rome at Porta Maggiore and took Via Labicana (today usually referred to as Via Casilina) along which he saw the newly built railroad which linked Rome to Naples and the arches of ancient Roman aqueducts; he then reached Tor Pignattara (the name given to the mausoleum of St. Helena, mother of Emperor Constantine) and San Cesareo on the slopes of the Alban hills, a location notorious for the brigands' assaults on the stagecoaches which used this route. 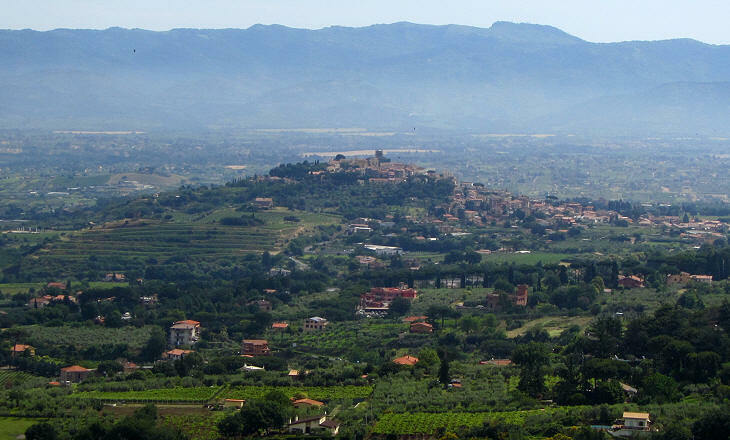 He then passed near, two small towns which were fiefdoms of the Colonna before being sold to other families. 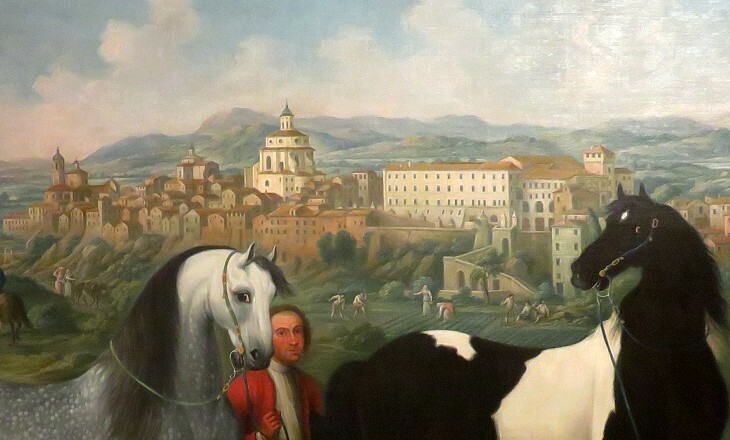 San Cesareo is located at the foot of a small hill which has at its top Colonna, a tiny town (it can be seen in the 1765 Grand View of Rome by Giuseppe Vasi) which was the first fiefdom of the family by the same name; in his account Gregorovius imagined the Colonna watching some of their possessions from the cradle of their power: Zagarolo, Palestrina, Genazzano and Paliano to the east and Marino to the south. 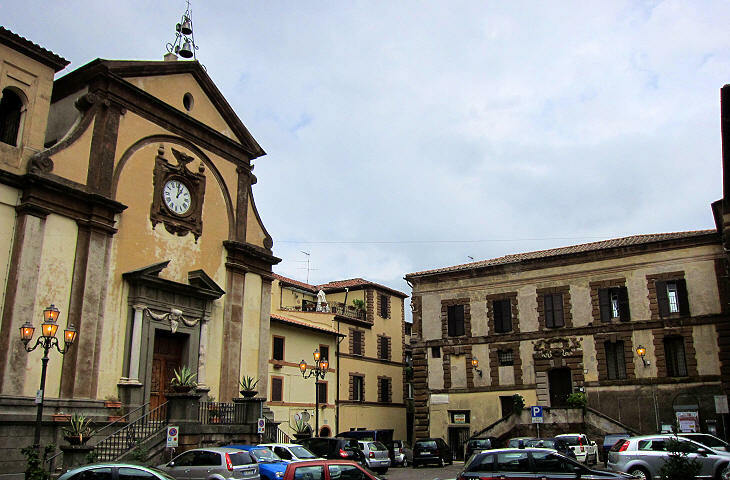 In 1856 the town did not belong to the Colonna any longer because in 1622 it was sold to Cardinal Ludovico Ludovisi, nephew of Pope Gregory XV; his heirs sold it to the Rospigliosi, the family of Pope Clement IX. 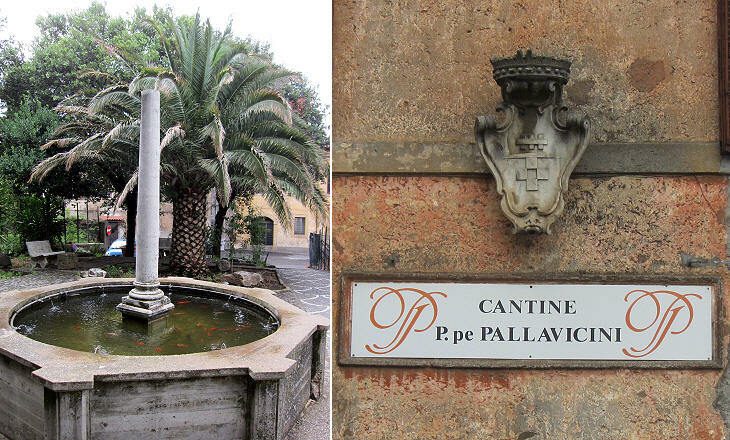 A member of this family, in order to comply with a requirement set in his will by Cardinal Lazzaro Pallavicini in 1680, changed his surname to Pallavicini (more on this topic in a page about Palazzo Pallavicini Rospigliosi in Rome). Colonna was surrounded by walls, but there is almost no remaining evidence of them because Pope Boniface VIII, during his conflict with the Colonna, ordered the town to be razed to the ground and forbade its reconstruction. Eventually Colonna was rebuilt, but it lost importance and it became an appendage of Zagarolo; its houses were built upon the ruins of the former walls in order to grant some protection to the inhabitants. 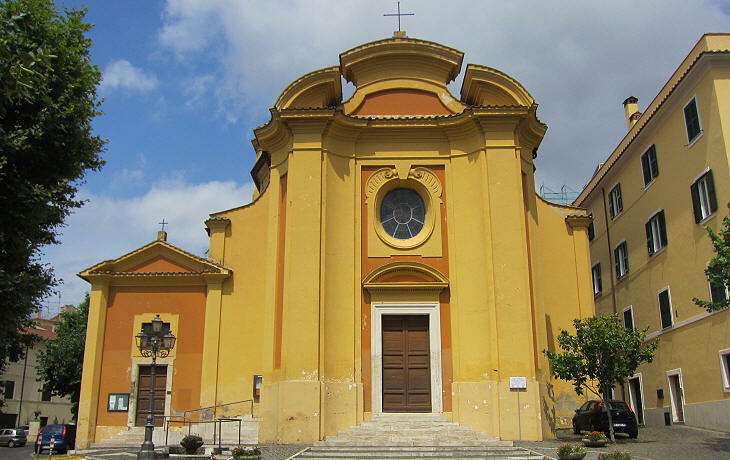 In 1756-71 the Pallavicini built a new church in what was at the time the main square of the town; it was consecrated by Henri Benedict Stuart, Cardinal of York and Bishop of Tusculum (Frascati). 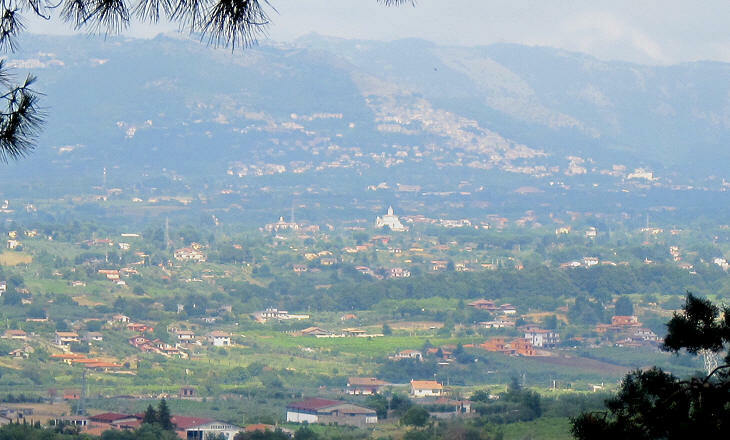 At San Cesareo Gregorovius branched off Via Casilina to reach Palestrina and he soon saw Zagarolo, with its buildings stretched on a plateau between two deep ravines. The plateau is very narrow and because of this the historical part of Zagarolo has only one street, from which dead end alleys lead to the houses which are on the edge of the ravines; local authorities have not found a way to reserve the most interesting sections of the street to pedestrians (or at least to forbid parking) and so cars are everywhere. According to tradition Zagarolo was founded by the inhabitants of Gabii, after their town was seized and pulled down by the Romans. Gregorovius reported the belief of some historians that Zagarolo was built on the site of ancient Pedum, another town conquered by the Romans in the IVth century BC; while today this proposed explanation is dismissed, many ancient columns, reliefs, inscriptions, sarcophagi and basins which embellish Zagarolo were found near the town, which therefore has an ancient origin. 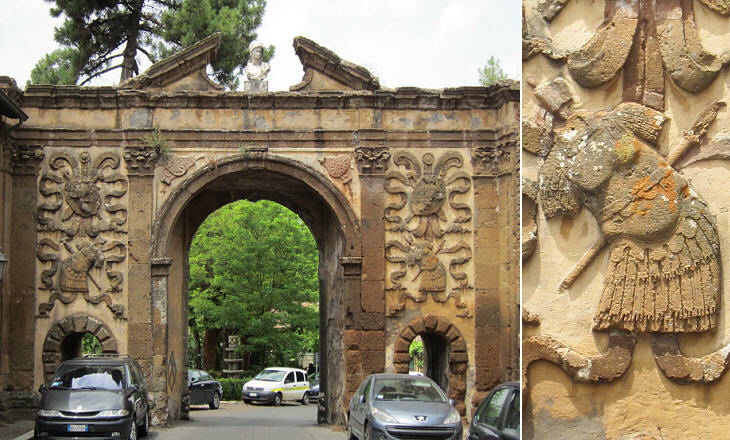 Zagarolo belonged to the Colonna until 1622 when it was sold to Cardinal Ludovico Ludovisi; in 1668 it was bought by Giovanni Battista Rospigliosi; in 1722 his son Clemente Domenico placed a large inscription with the family name on the main gate of Zagarolo; because of this, the gate is known as Porta Rospigliosi, although it was built by Marzio Colonna in ca 1600. 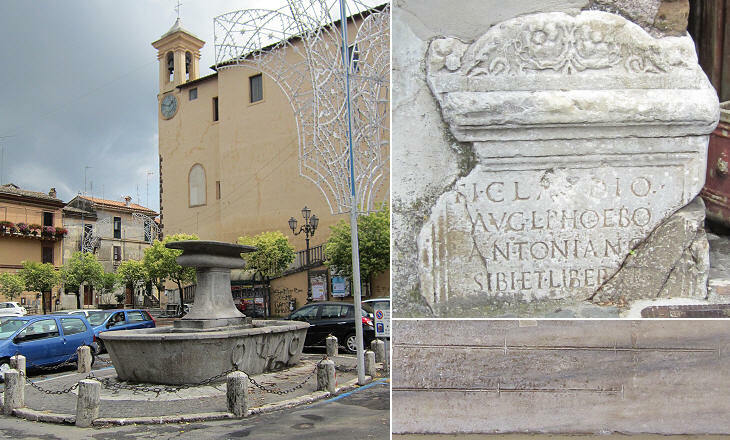 The use of a local brown tufo stone to obtain contrasting decorative effects is a characteristic of all the monuments of the town. Zagarolo had a medieval aspect until 1569 when the Colonna were given the title of Dukes of Zagarolo by Pope Pius V; in particular Marzio Colonna, son of Marcantonio II, one of the commanders at the 1571 Battle of Lepanto, decided to live in the town and to give it an appearance appropriate to his rank; Marzio's choice of the two reliefs shown above was probably suggested by the triumphal procession Pope Pius V granted to his father at his return from Lepanto (which is re-enacted every year at Marino). 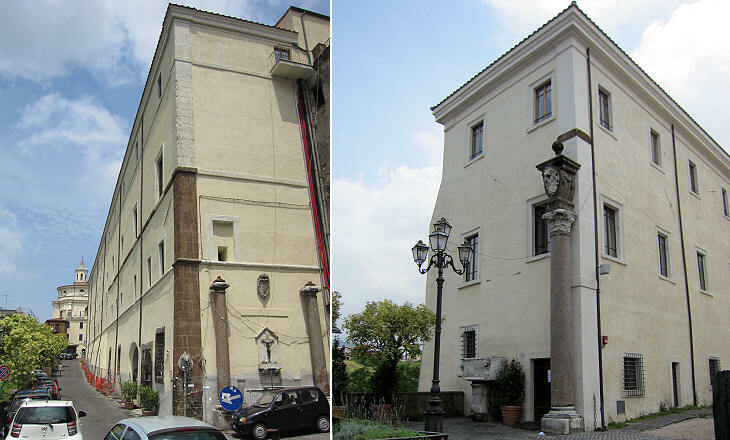 The Colonna turned the medieval family castle at Zagarolo into a modern building which did not retain any evidence of its former use; imposing ancient granite columns were placed outside the palace. In 1606 Marzio Colonna gave asylum to Caravaggio at Zagarolo, after the painter had killed a man in Rome; in return Caravaggio painted a second version of the Supper at Emmaus (external link) for him. In 1605 Marzio Colonna was inducted into the Order of the Golden Fleece, one of the most prestigious chivalry orders, by the German Emperor. Pierfrancesco, his successor in 1607, inherited a difficult financial situation and in addition he was a passionate gambler; in 1622 he was forced to sell Zagarolo and Colonna to Cardinal Ludovico Ludovisi who enriched the palace with a gallery for his collection of ancient statues (now at Museo Nazionale Romano at Palazzo Altemps); the Rospigliosi spent their summers at Zagarolo and they decorated several rooms with paintings. 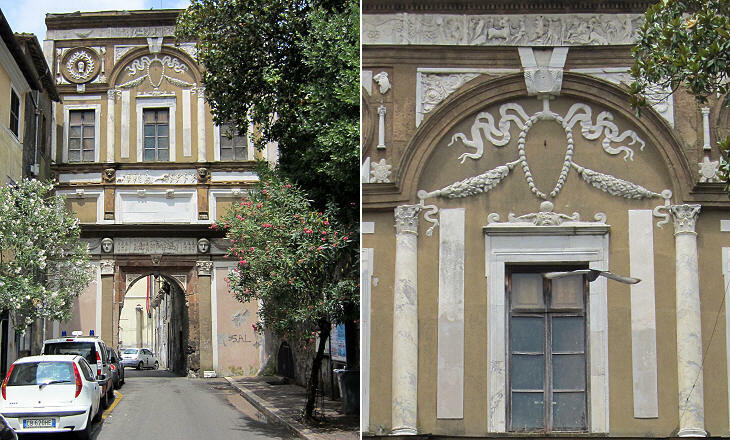 Palazzo Colonna Rospigliosi was damaged during WWII when it was turned into a military hospital by the Germans and after the war when it provided temporary accommodation to many inhabitants who had lost their homes. In 1979 the building was bought by municipal authorities; its restoration is not completed yet, but it has made significant progress. 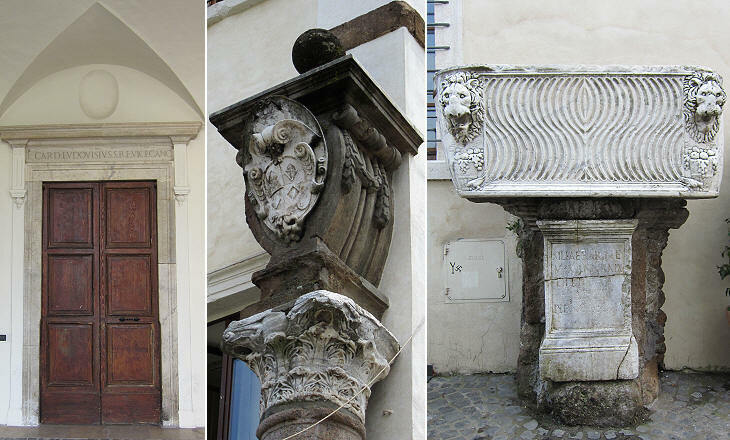 The Colonna did not limit themselves to redesigning their palace, but they entirely redesigned Zagarolo by opening a straight street from it to Porta S. Martino, the gate at the northern end of the town; the heart of new Zagarolo was a square piazza with a church and a series of buildings and porticoes having a similar design and decoration. 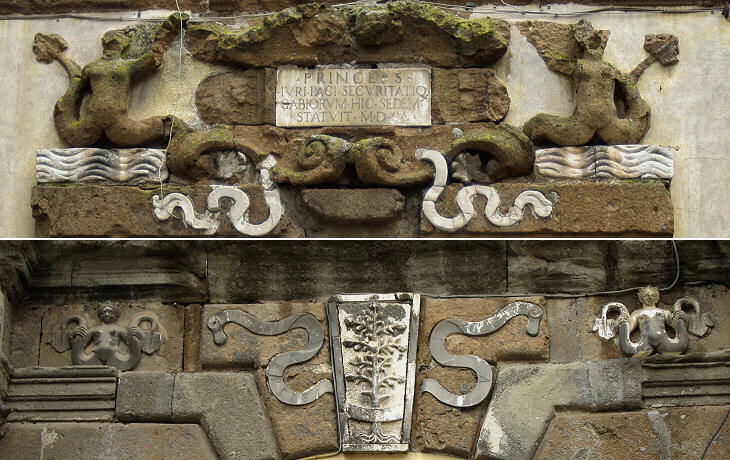 Piazza del Mercato was given a very urban appearance and the buildings which surrounded it housed the Town Hall and the Tribunal; the porticoes were used as a marketplace; the decoration of the complex was based on columns and mermaids, another heraldic symbol of the Colonna. 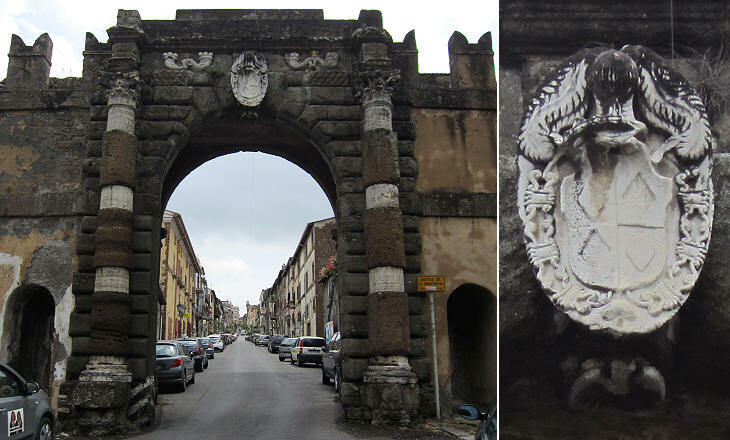 Piazza del Mercato: (above) inscription on the Tribunal: "Juri Paci Securitatique Gabiorum Hic Sedem Statuit MDCV" (here was established the see of Justice, Peace and Security for the inhabitants of Gabii in 1605); (below) decoration of an arch of the portico with the motto "In adversis lucet", a quotation from Claudian meaning "he/it shines (more) in a difficult time"
The design of the square and of its buildings is generally defined as vignolesco, with reference to Giovanni Barozzi da Vignola, an Italian architect who worked with Michelangelo and wrote Canon of the Five Orders of Architecture, a treatise which guided the activity of many architects of the late XVIth century. Some sources indicate the name of Carlo Maderno for the final design of the Tribunal and of the Town Hall. 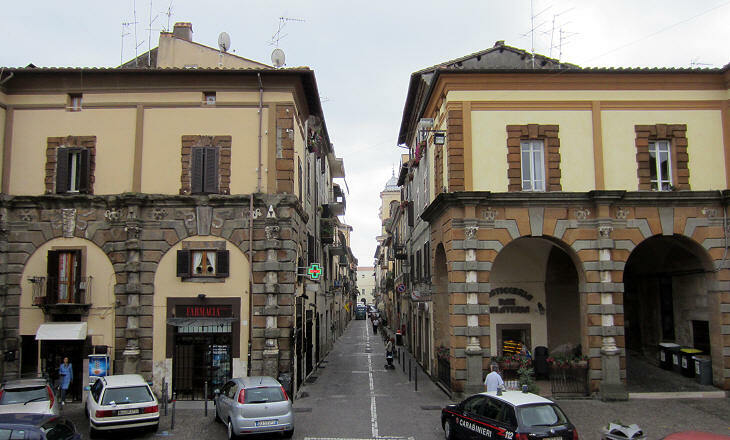 The Colonna enlarged (or rather stretched) the town by developing its northern end; the new quarter and the new gate were dedicated to St. Martin in honour of Pope Martin V, the only pope of the Colonna family. 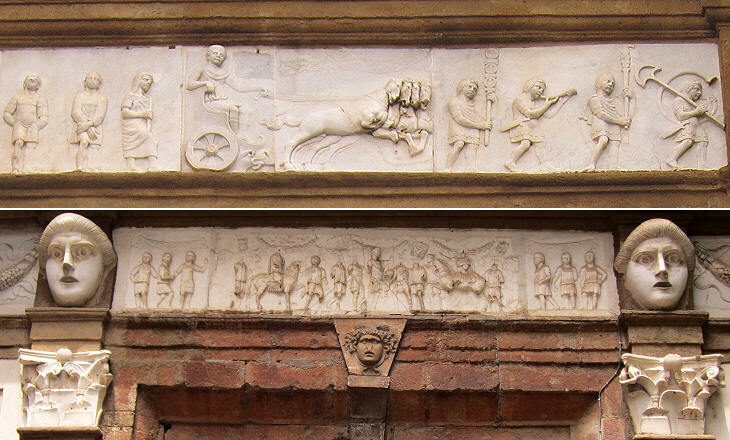 The internal side of the gate was decorated with military emblems, but the curved lines which were fashionable in the XVIIth century made the Roman military uniforms more likely to be worn by dancers than by soldiers. 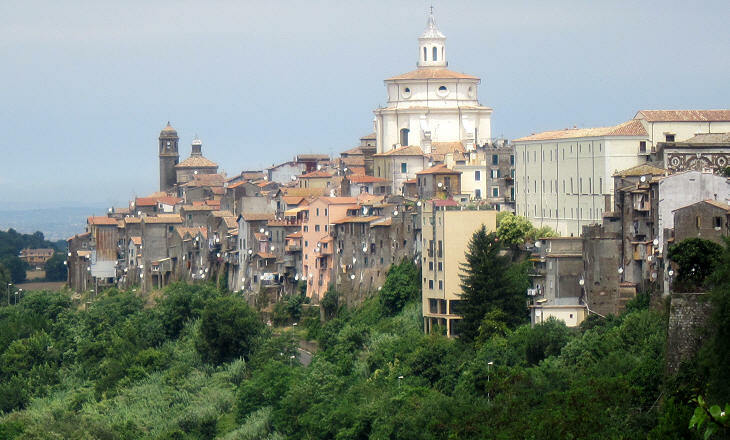 Small towns near Subiaco: Cervara and Rocca Canterano; Trevi and Filettino.